Immigrants come to Houston from around the world for a variety of reasons. In many of these cases, an immigrant travels to Houston to be reunited with family. Others are victims of violence or oppression, and seek a safe place where they are free to live their lives. Options are available to people seeking to live in or visit the United States. U.S. citizens and permanent residents may sponsor certain family members, and options like U-visas are available for people seeking refuge. However, they all involve navigating the complicated U.S. immigration system. 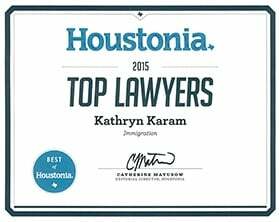 Kathryn Karam is a Houston immigration lawyer who assists in uniting families across borders, as well as helping other people who are seeking to move to the Gulf Coast area for any reason from another country. She assists with family-based immigrant and nonimmigrant visas, U-visas, VAWA petitions and Special Immigrant Juvenile (SIJ) cases. Kathryn Karam seeks innovative solutions to some of the most difficult immigration situations. No matter how complicated your immigration matter, Kathryn Karam can take it on. Call Karam Immigration Law at (832) 582-0620 today to set up a consultation. Kathryn Karam works with people seeking immigration assistance throughout the Houston area, including in Cinco Ranch, Sugar Land, Alief, Bellaire, The Woodlands, Cypress, Tomball, League City and Clear Lake. U.S. citizens and permanent residents can sponsor certain family members for permanent residence, or what is often called a "green card." Becoming a permanent resident means the person has many of the rights and privileges of a U.S. citizen, and, under most circumstances, permanent residence is indefinite and requires only that the resident card be renewed every 10 years. It is also an important step for those who seek to become U.S. citizens. The wait list for some people seeking to sponsor family members may be long — decades long, especially for people who are permanent residents seeking to sponsor a spouse or unmarried children. However, U.S. citizens seeking green cards for spouses, unmarried children younger than 21 or, in many circumstances, parents, may obtain a green card with no wait time. To sponsor a family member, you may need to sign an Affidavit of Support (Form I-864). This will make you financially responsible for your family member. If you are engaged to a U.S. citizen, then he or she cannot sponsor you for permanent resident status until you are married. However, you can seek a K-1 visa, or "fiancé/fiancée visa." Your children may be eligible for K-2 visas to allow them to accompany you. If you are in the United States on an employment-based nonimmigrant visa, there are usually options allowing you to bring your spouse and children with you. For instance, a person with an L-1 visa may seek an L-2 visa for a spouse. Your children will be able to attend school in Houston. If you are the spouse, parent or child of a U.S. citizen or permanent resident who abuses you, but you do not have legal status or would not if separated from that person, you may seek legal status under provisions of the Violence Against Women Act (VAWA). Despite its name, the law applies equally to women and men. To qualify, you must demonstrate that you have been battered or subjected to extreme cruelty, you resided with the abuser, and you must demonstrate that you are a person of good moral character. If married to the abuser, the marriage must have been in good faith — it cannot have been for immigration purposes. Common-law marriages are valid for these purposes. If your spouse was removed or lost permanent resident status due to domestic violence, you also qualify. If you qualify for VAWA protection, you will be authorized to work in the United States, and any removal proceedings may be cancelled. You will also be eligible to seek permanent resident status. Victims of certain crimes involving mental or physical abuse who are helpful to law enforcement officials may qualify for a U-visa. Minors who have been abused or abandoned by their parents whose best interest is in remaining in the custody of a caretaker in the United States may qualify to apply for Permanent Residence as a Special Immigrant Juvenile (SIJ). Adjustment of Status via the SIJ petition process is available even where the minor entered the United States illegally. Kathryn Karam is a Houston immigration lawyer who helps unite families and assists crime victims who are facing being sent away from the area they now call home. As a Board Certified Immigration Attorney, she will seek a creative solution for your dilemma. Call today at (832) 582-0620 to set up a consultation.